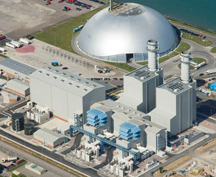 A natural gas fired CCGT power station is one of the most efficient power stations in the UK, combining high thermal efficiency with advanced operating procedures to produce electricity economically with minimum environmental impact. Ready access to correct drawings and documentation for maintenance purposes are key to maintaining this efficiency. The plant was handed over with 40,000 documents and drawings and a supplier-provided document database of limited functionality. Finding documents was sometimes taking hours. Management soon realized that a proper engineering document management system (EDMS) would be required. Trix Organizer was selected from a number of competing candidates and implemented in under eight weeks. In addition to searching on known metadata the system is set up with Graphical Search so users drill down and click on 'hot spots' in photo images of the plant to locate the documents for that region or piece of equipment. In a major project to refurbish and boost output of a large power plant the entire existing plant drawings and documents were indexed, de-duplicated and loaded into Trix Organizer. The documents are served up over the Web directly from Organizer's Advanced Project Module to sub-contractors in multiple locations around the world. Modifications are checked back in and routed for approvals using the Workflow and Task Management Module. Amongst the 'documents' being loaded into Trix Organizer are entire subsidiary databases such as those generated by MathCAD. This illustrates Organizer's versatility—virtually any file format can be stored and managed.